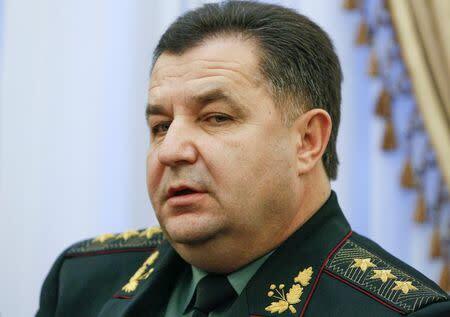 KIEV (Reuters) - Ukraine's defense minister called on Friday for a doubling of the military budget next year to allow the army to buy weapons abroad and better equip itself to fight Russian-backed separatists in the east. During a visit to Kiev last month, Lithuanian President Dalia Grybauskaite said Lithuania would provide Ukraine with military aid, but did not specify if this would include weaponry or be of the non-lethal kind. Ukraine would also shift some of its military units closer to Moldova, its south-western neighbor, because of what it saw as a threat from Moldova's pro-Russian breakaway region of Transdniestria, Poltorak said. "We are facing the threat from our eastern border. But there is also a threat from Transdniestria and from the south and the quantity of our units there will be increased," he said.